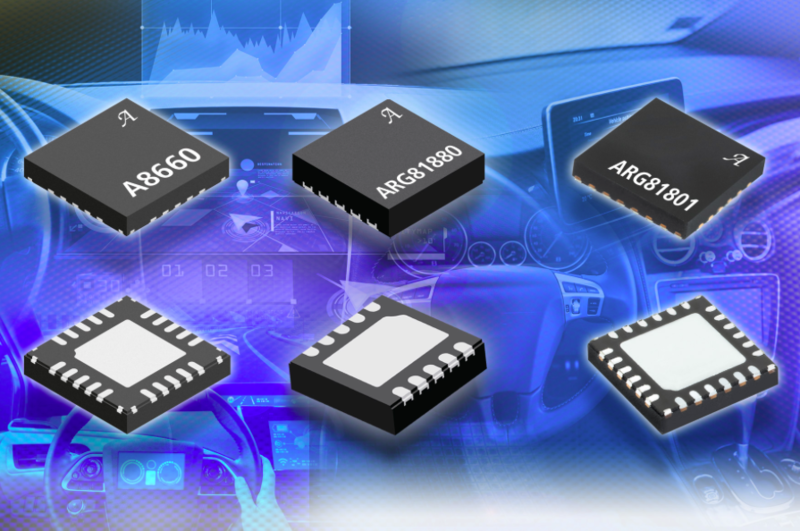 Allegro MicroSystems Europe has announced the A8660, ARG81880, and ARG81801, the latest additions to its regulators portfolio. These devices reduce EMI through switching frequency dithering and allow system noise management though external clock synchronisation. These devices are AEC-Q100 automotive-qualified, designed to operate over a wide input voltage range to withstand automotive stop/start, cold crank and load dump conditions, and are also capable of switching at 2.2MHz for reduction in component size and cost. Comprehensive safety and protection features enable robust designs and simplify component qualification. The devices cover a wide output current range (from sub 1A to 10A), provide tightly regulated supply rails across temperatures, and are targeted at applications such as ADAS, HUD, telematics, infotainment, clusters, camera recorders, ECUs, smart appliances, industrial automation/robotics, IoT and others. Reference designs and demo boards are available to simplify design and evaluation. The A8660 synchronous buck controller can drive loads of up to 10A and addresses the constantly growing need for higher power in automobiles and industrial equipment. It features flexible power monitoring with adjustable rising delay for microcontroller reset and power sequencing. A high voltage, battery-short tolerant enable input, combined with a second logic level input signal simplifies ignition input driven automotive designs. The A8660 is offered in a 4×4 QFN-20 wettable flank package with exposed power pad (suffix ES). The ARG81880 saves board space and system cost as it requires only 3 external components. Selectable current limit minimises inductor and capacitor size. Its 20ns controllable on-time facilitates 18V to 2.5V conversion at 2MHz without pulse skipping. It provides up to 800mA of output current and is offered in a low-profile 10-pin 3×3 QFN exposed pad wettable flank package.